Man o’ War’s 100th Birthday – Let’s Celebrate! Today marks the 100th anniversary of the birthday of Man o’ War. Foaled March 29, 1917, this large chestnut horse was dubbed the Horse of the Century, that’s the 20th Century, with his incredible 20 wins out of 21 starts. Man o’ War was bred by August Belmont, Jr. and sold at auction as a yearling for $5,000 to Samuel D. Riddle. His name originally was My Man o’ War, named by Belmont’s wife since her husband had gone off to serve in World War I. The auctioneer dropped the “My” and his name became Man o’War. His two-year-old race year in 1919 started out with 6 consecutive wins. Here’s an example of the grueling pace race horses of the early 20th century faced. He started his career at Belmont Park with wins on June 6th, 9th, then another win on June 21st at Jamaica Racetrack followed by two wins at Aqueduct on June 23rd and July 5th. He had a short break before heading up to the Saratoga Race Course, then the premier racetrack in the nation, for four races on August 2nd, 13th, 20th and 23rd. It was during his Saratoga appearance that he met his only defeat by a horse named “Upset” during the Sanford Memorial on August 13th. In 1919, there were no starting gates. Horses lined up at a wide ribbon, they would turn around once to line up and then the ribbon would rise up. At this race, Man o’ War’s first jockey Johnny Loftus was late in turning the 16.2 hand horse around in time for the start. He was not off to a good start, back by four lengths. It was a short race, just 6 furlongs, and by the time Man o’ War caught up, he managed to pass every horse but one. He came in second only by a neck’s length. Had the race been another furlong, he would have won. The 1920 race season was the start of his undefeated 3-year-old career. By now carrying 138 pounds, more than any other horse he competed against, and a new jockey Clarence Kummer, his first race was the Preakness Stakes. His owner did not enter him in the Kentucky Derby because he thought a mile and a quarter was too long a race to start off the season. Back then the term “Triple Crown” had not been formally coined or commercialized. Big Red’s next win came at Belmont Park on May 29th in the one mile Withers Stakes. It’s amazing that Riddle entered him in a race between the Preakness and the Belmont Stakes. But then again the Belmont Stakes was only a mile and 3/8th, not the marathon mile and half of today. But it didn’t matter, Man o’ War went on to win the Belmont Stakes by 20 lengths. A record not broken for 53 years until Secretariat came along in 1973 with a 31-length victory. Big Red had 11 races in 1920, including big stakes races such as the Travers Stakes and the Jockey Gold Cup. He also broke the record for the longest win in a race of 100 lengths in the Lawrence Realization Stakes at Belmont Park just a week before the Jockey Gold Cup. By the end of the season nobody wanted to race against him, and his record-breaking 28-foot stride, so a match race was set up with the 1919 Triple Crown winner Sir Barton in Canada on Oct. 12th. It wasn’t much of a race as Man o’ War led from the start, won by 17 lengths, and took 6 seconds off the track record. And that’s with iron horseshoes! It was the first time a horse race was filmed in its entirety. As with all great racehorses, Man o’ War went off to stud in Kentucky. But his retirement was different. He had become a national sports hero. All his races were broadcast on the growing medium of radio. Everyone in America knew about this horse. He was so famous people traveled to see him. He had an African-American groom Will Harbut who cared for the horse and coined the term, “De mostest hoss that ever was.” He sired 64 Stakes winners, including War Admiral, the 1937 Triple Crown winner. By 1926 he was named the top sire. In 22 seasons at stud he produced 379 live foals. Even American Pharoah has Man o’ War in his pedigree 17 times. When Man o’ War passed away on November 1, 1947 at the age of 30, the country mourned. When he died, Faraway Farm called the Associated Press to announce, “Our big horse just died.” He died of a heart attack, but his longtime groom Harbut had suddenly passed away one month earlier, and many said that Man o’ War died of a broken heart. He was embalmed and lay in state for two days so all his fans could come and visit him one last time as he lay in a custom made coffin lined with black and yellow silk, Riddle’s racing colors. His funeral was broadcast on the radio. He was laid to rest near a life-size bronze statue of him on Faraway Farm. Over the years, fans flocked to pay their respects. In the 1970’s the grave and statue were moved to the newly opened Kentucky Horse Park in Lexington where fans still come to visit. To celebrate the 100th anniversary of the birth of the greatest horse ever, the park has restored the bronze statue and planned yearlong events around history’s most famous racehorse. Happy Birthday Linx! 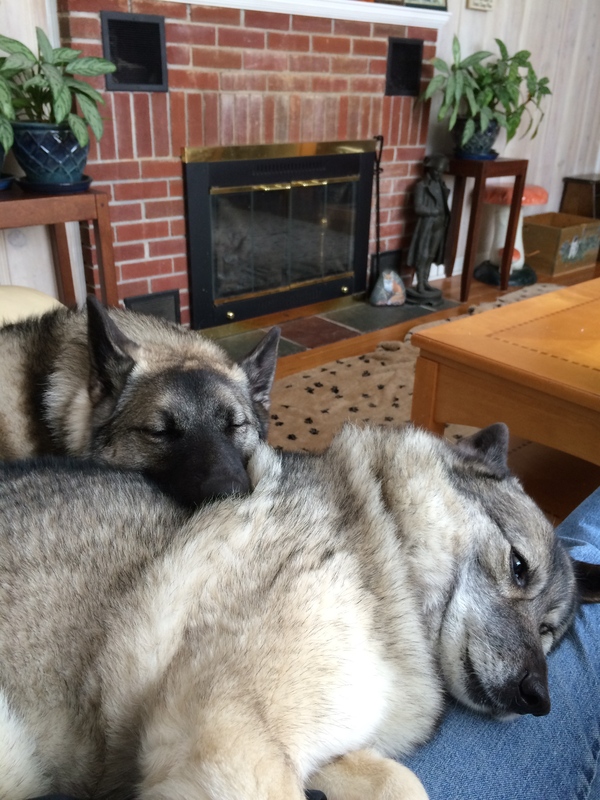 10 years of pure Norwegian Elkhound fun! 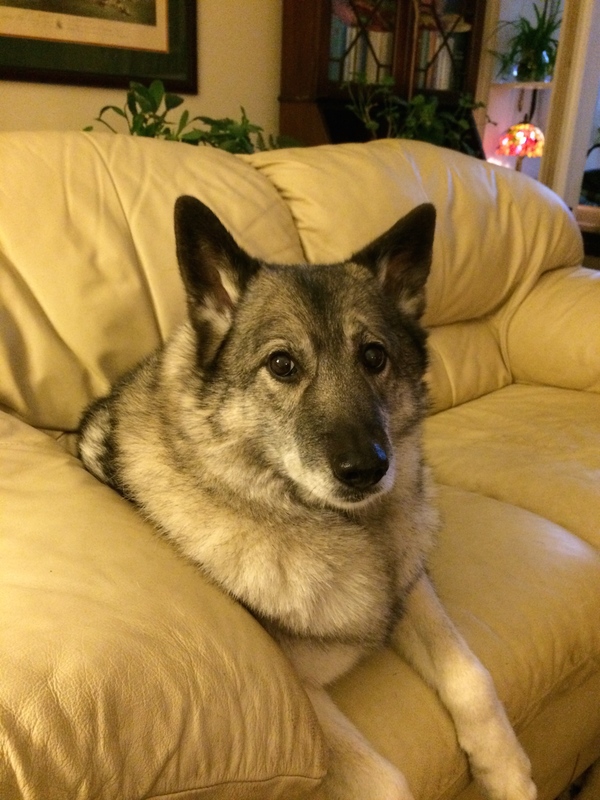 In honor of Linx’s 10th birthday today, a glimpse into his decade of doggie fun! Officially known as CH. Elvemel Casino Royale CGC, son of CH. Kestos Kriega x Jinx, CH. Elvemel For Your Eyes Only. Read about his life on the road, in the ring, and in our hearts. Last week we learned husbands have birthdays and hounds have human age equivalents. But what about horses? Unlike purebred dogs, most horses don’t come with registration papers with their birthday proudly displayed, so it’s a guessing game. Even Thoroughbreds registered with The Jockey Club lose their actual birthdays to the convenient New Year’s Day in order to have a consistent racing year. It’s easy to look at a very young horse’s mouth and see which milk teeth have appeared or been replaced by permanent teeth in determining his age. Once a horse is considered ‘aged’ (9-years-old and beyond) there are other more subtle signs to look for. 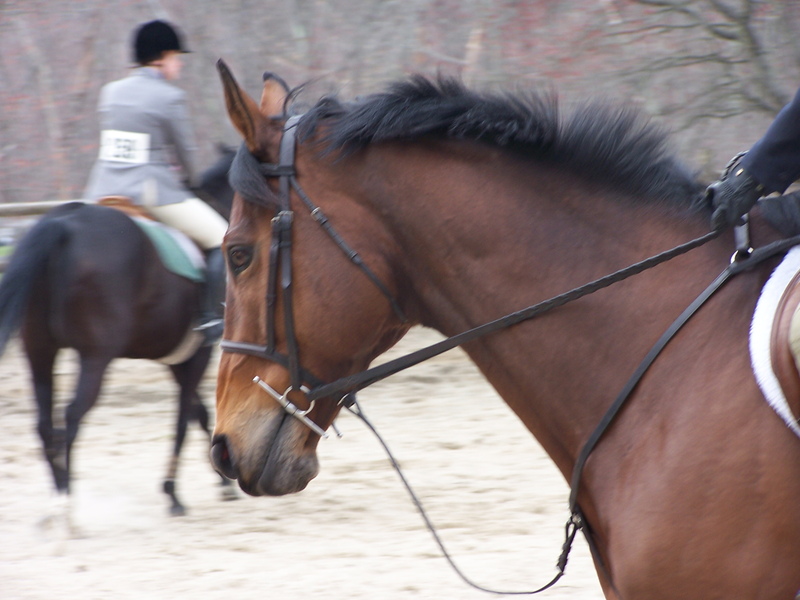 Unlike dogs and humans, horse’s permanent teeth continue to grow throughout their life. This phenomena ensure a lifetime of grass grazing and grain grinding. As they age, horse teeth also change shape and develop markings. As a Thoroughbred registered with The Jockey Club, Mikey’s birthday is always January 1st. Cups: The shape of the tooth changes from rectangular to triangular as the horse ages. When you open the mouth of a young horse and view the bottom front teeth (center and corner incisors) on the grinding surface from above, you will see dark rectangular centers called ‘cups.’ These cups are visible on all incisors by age 5, but slowly disappear from the teeth progressively. They fade first on the bottom from the center teeth out to the corners and then on the top from the center out to the corners, so by age 11 all the cups should be gone. Stars: As the cups begin to disappear, a ‘dental star’ appears on the grinding surface towards the front of the tooth. This yellow-colored spot starts out rectangular and becomes rounded with age and will eventually replace the cup on each incisor. The stars begin to show up around age 8 on the center teeth and appear on the corners by age 11. Galvayne’s Groove: This dark-colored groove is located on the incisors at the upper corner of the mouth, just before the canine teeth. This groove won’t appear until the horse is around 10 years old. It appears first at the top of the tooth and works it way down the front of the tooth. It reaches the middle of the tooth by age 15. Then it continues down to the bottom of the tooth by age 20. Then it reverses itself and starts to disappear from the top of the tooth, so by age 25 it’s only visible on the lower portion of the tooth. By age 30 it should have disappeared from the tooth. Hooks: Another clue to determining age can be looking for hooks on the top corner incisors. Uneven wear on the upper and lower corner incisors can cause a hook to form at the back and bottom on the top corner incisor. The first hook appears at age 7 and disappears at age 9. Then it re-appears at age 11 and remains until the mid-teens. Is there an equivalent human age for horses? It appears about a decade ago, as part of a marketing campaign from Pfizer Animal Health (now Zoetis) to promote their Strongid daily wormer, they released The Age Relationship Chart which calculates a horse’s age in human years. A rough estimate said that horses are basically 6.5 years old when they are born (because when they are born they can stand and run) and will age that fast (in human years) until they reach four. After that they settle into a 2.5 human years for every actual horse year for the rest of his life.